Occasionally, I look through projects on Kickstarter for something of interest. ( I can't do this too often, because I don't want to tempt myself too much.) I actually have two projects that currently I'm awaiting delivery on. I am always on the look out for a game that gives a great role playing game (RPG) feel without the role-playing work. So I stumbled across the game Heldentaufe on Kickstarter. This game bills itself as a family-friendly adventure game, with both cooperative and competitive aspects. It looked to have a few RPG elements to it. Keeping in mind that it is a Kickstarter project, and not a full-fledged game yet, I obviously haven't played it. However I must say that I am impressed. The artwork is beautiful, evoking that adventurous feeling without being too dark for younger players. The rules are pretty straight forward from what I can tell, and should not be a problem for younger ones, particularly since the cooperative aspects of the game allow a little help for the younger player. As a result, this game is very approachable. I have to say that if my son were still at a young age, I would have back this almost instantly. His love of fantasy adventure would go right along with this, and the combination of the theme in the artwork would have sucked him right in. If you were looking for that kind of adventure game with younger players, or something that is a lighter adventure game for your casual gaming friends, I think this is definitely worth a look. The Kickstarter campaign as well run, and you will find a lot of information on the website. This includes videos how to a copy of the rulebook in its current state, and everything else you need to decide if this is for you. Hurry, there are only a few days left in the campaign. Find it here on Kickstarter. 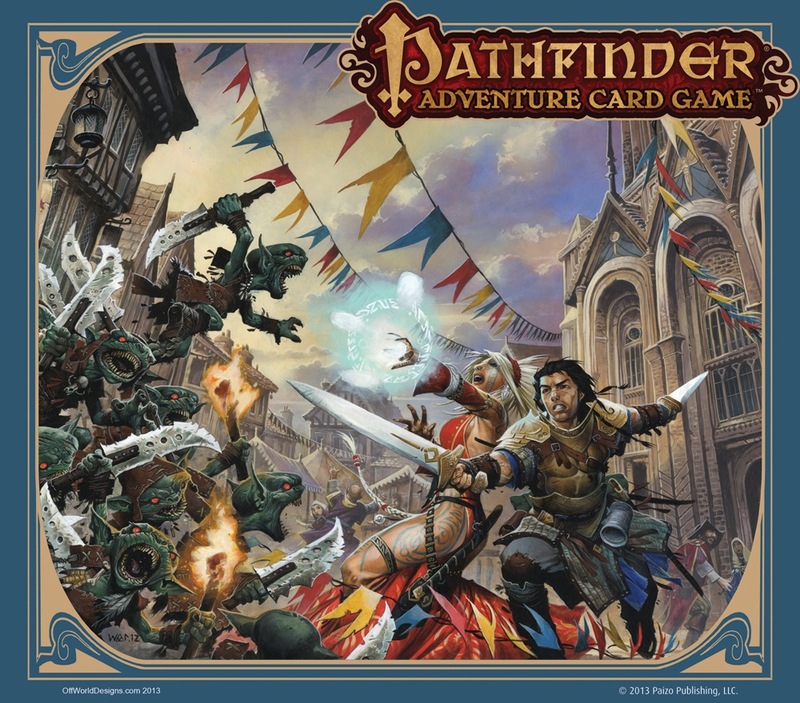 I mentioned previously that we had finished our Pathfinder Adventure Card Game campaign. I thought I would give a few notes on what the experience was like. So, I had a blast playing this game. At the same time, I am glad to give it a rest now that we have completed the adventure.Thirty-three separate scenarios was quite enough. When we started, those of us involved had very flexible schedules. But as we found other jobs and the party grew, it became harder and harder to find time to play. (This is another way it felt like a role playing game, but not really one I was looking for.) It took us a year and a half to complete the entire adventure. We were determined to get it done by the end of 2015. I think the final session was scheduled two months in advance, and occurred on December 29th. It was pretty crazy. Is the game perfect? No, definitely not. First of all, the rules were not always clear. The evidence of this is the number of questions asked on BoardGameGeek about the rules, though we didn't have any problems ourselves. (Which doesn't mean we were always doing things right!) My understanding is that the second and third adventures were cleaned up some. This is also an expensive game. By the time I was done purchasing all the expansions and some extra dice, I probably had close to $200 invested in this game. That does not count the time that I spent finding maps online, reading backstory articles, but that was all really fun, so I'm not sure that does count. I realize that $200 sounds like a lot of money, but when you consider we probably had somewhere in the neighborhood of 35 hours of play in the entire game, that works out to just under $5.75/hour, which is still cheaper than going to see a movie. But those of you who have been reading my blog know that I think games are a good investment in both time and money. Will I play it again? Yes, but we are looking for which scenarios are essential, so that we can shorten the total campaign time. There are also some fan made Adventures using the same cards, and we may try one of those out in the future. It would also be interesting to try again with different characters. So while all the plot twists and turns may be known, it would still be fun. After all, I have read The Lord of the Rings eight times cover to cover. My guess would be that you also have a book or movie that you have gone back to time and time again. A post like this is almost obligatory. Nonetheless, it fascinates me every year to go back and look at what my gaming over the previous twelve months has been. It will delay the discussion on the gaming group I mentioned a while back, but that will come. From a personal perspective, 2015 turned out to be a good, but not great gaming year. Satisfying, but not the gluttony of games that I hope for every year. I managed 117 plays of a total of 43 games. Of these, 17 were games I had never played before. None of those 17 were eye-popping; probably the most pleasant surprise was the game Dead Man's Draw, a filler that has some legs to it. Of the 117 plays, I had two games that were nickels (at least five plays during the year): The Resistance and Spot It!. Two games were dimes (10 plays): Star Realms and Hive. I almost had a quarter (that's right - 25 plays) in Pathfinder Adventure Card Game. We finished the campaign this year - all 33 scenarios - over the holidays. I acquired thirteen games and three expansions in 2015, which is actually the lowest in several years. Because of the way schedules worked out, that really includes a few Christmas presents from last year as well as this year: a total of five games. Two games were from trades. So I am successfully curtailing the growth of my collection. This is helped by the fact that I am getting pickier, since I already have a great collection. Those are the highlights. I never made it to a convention. I didn't attend any local events. But it was a fun year. I think that's because gaming is like pizza - even when it's not so good, it's still pretty great.